A Mk1 stabiliser, all male spades, and no calibration screw. 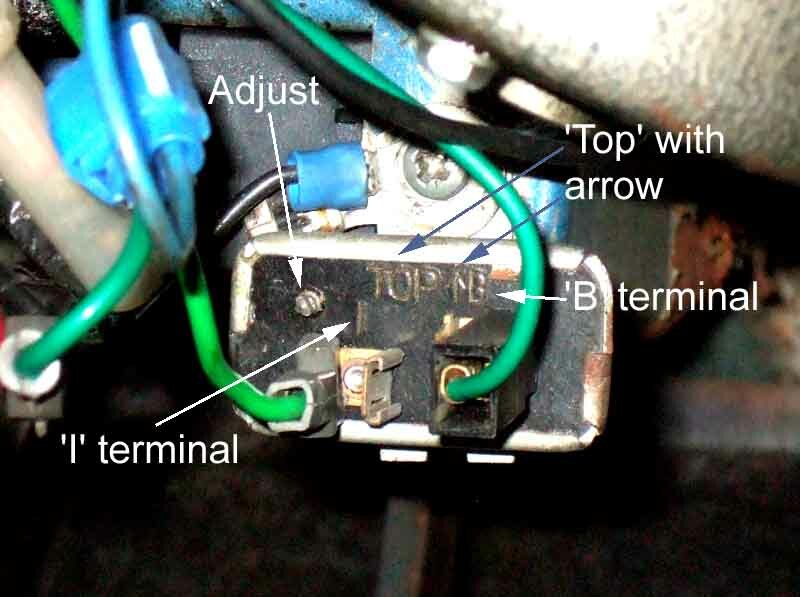 Green goes to the B(attery) terminal and light-green/green to the I(nstruments) terminal. 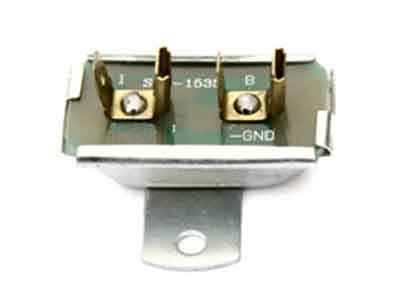 The E terminal goes to a case rivet and hence earth through the mounting tab. Note the stabiliser needs to be mounted above the fixing screw. 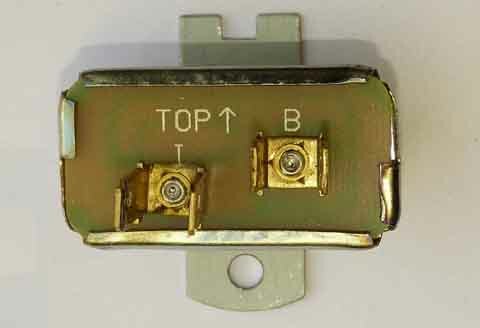 An electronic version compatible with the Mk1 wiring, and mounted above the fixing screw. 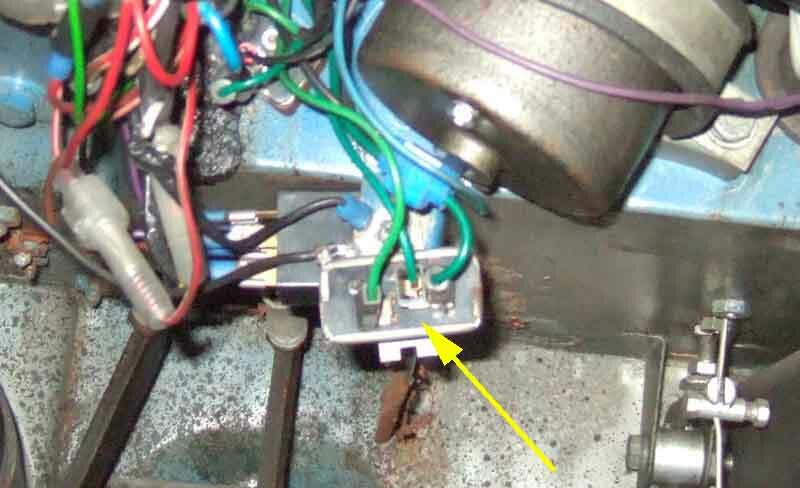 This still has the 'Top' and arrow markings, but the printed circuitry can seen through the insulating piece the spades are mounted on. No calibration screw. 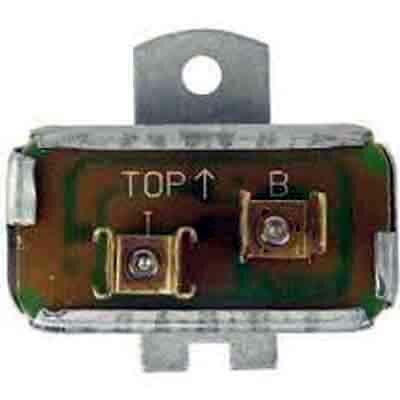 An electronic version compatible with Mk2 wiring, and mounted below the fixing screw. Still with 'TOP' and arrow markings, but the printed circuitry even clearer. Again no calibration screw. Yet another version from some sources, this time with one male and one female spade on each terminal. As there only ever seems to be two wires going to the stabiliser, hence only one spade on each terminal is used, I suppose this could be classed as a 'universal' replacement as it will be compatible with both Mk1 and Mk2 wiring. 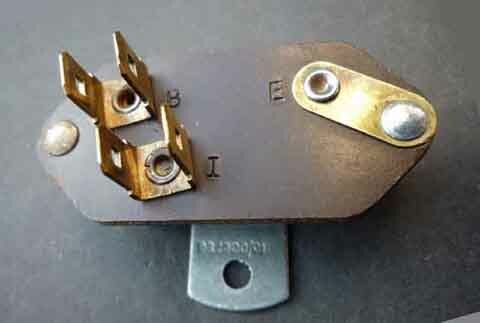 An original Mk2 thermal voltage stabiliser, with the adjuster stud. Note the 'I' ('Instrument') terminal has female spades and needs a male spade on the end of the light-green/green wire. 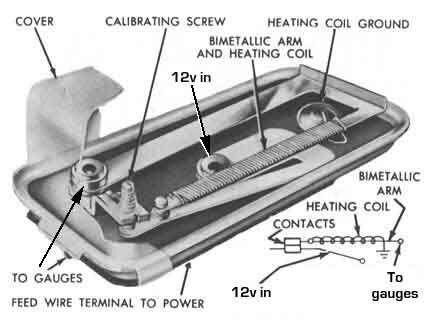 The 'B' terminal ('Battery') has a conventional male spade on the stabiliser, and hence a female spade on the green wire. Note just to be different this stabiliser is mounted below the fixing screw. What lies inside, from Bob Skelly. 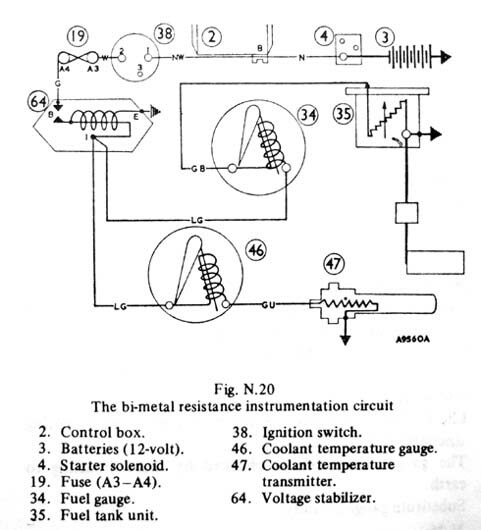 Drawing from the Leyland Workshop Manual, with errors. 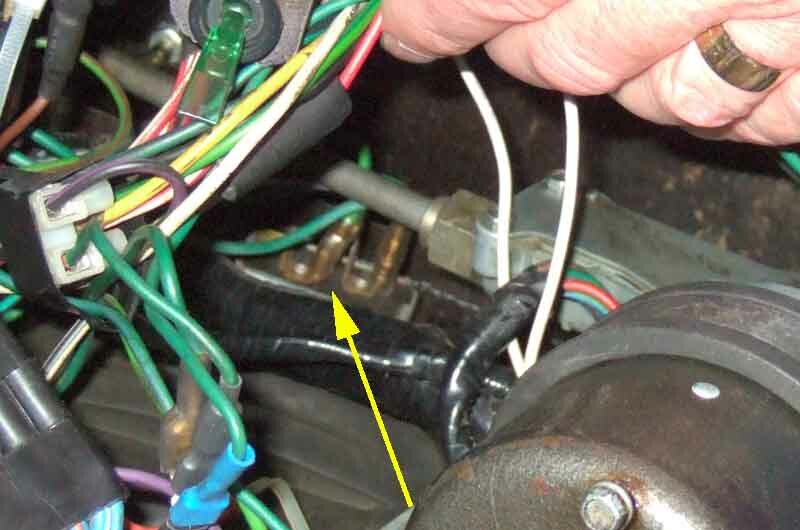 As shown, with the contacts open, the gauges would never work as there is no path for 12v to pass through to them and the senders. The contacts should be drawn closed. 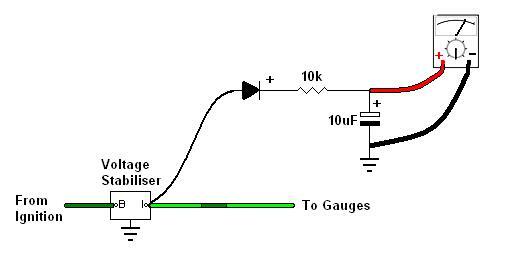 Also the colour of the wire(s) from stabiliser to gauges is light-green with a green stripe, i.e. 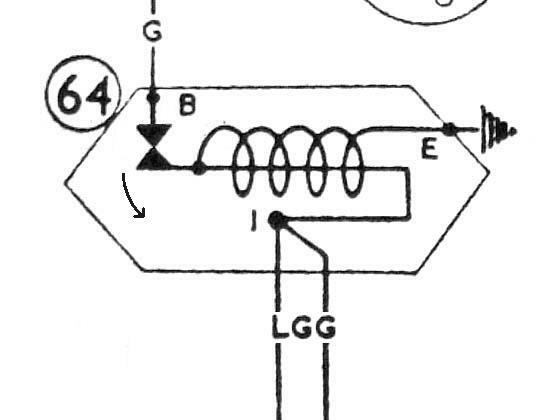 'LGG', and not 'LG' a shown. Drawing corrected, with arrow, showing direction of movement of the contact on the bi-metal trip. On my 73 roadster the stabiliser is positioned high up on the bulkhead, behind where the wiper rack exits from the motor - not very accessible. On later models (this is my 75 V8) it is positioned on the lower edge of the bulkhead and much more accessible. Demonstrating a faulty stabiliser: Working normally on the left; faulty with ignition on engine not running in the middle; faulty with engine running (make sure you blip the throttle so the alternator is charging) on the right - a significant difference. The gauge should read the same with the ignition on regardless of whether the engine is running or not. A test-rig to measure/calibrate the stabiliser output on negative earth cars (reverse the diode and meter connections for positive earth cars).